CRISPR-Cas9 could soon transform patient care, but process efficacy needs to be honed and delivery technology needs to be refined first. It may still seem like science fiction, but the ability to nip-and-tuck problematic genomes to cure disease is easier than ever – and will soon be getting easier. 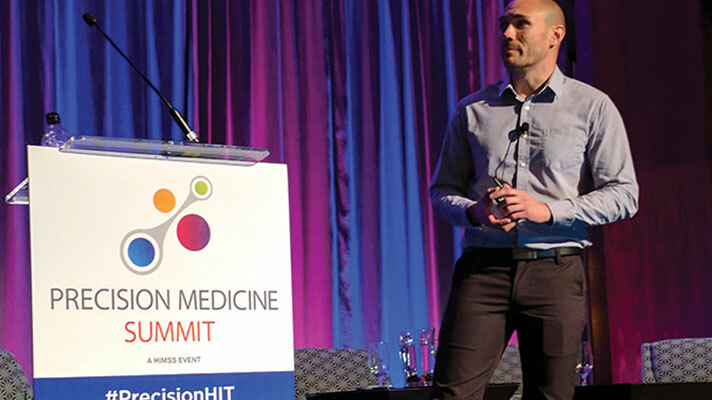 At the HIMSS Precision Medicine Summit on Monday, Ross Wilson, principal investigator at UC Berkeley's California Institute for Quantitative Biosciences, explained how tools such as CRISPR-Cas9 are set to transcend the confines of the lab to fundamentally change clinical care. While there have been some intriguing recent strides made with gene editing technology, Wilson admits that – so far, at least – CRISPR's "hype eclipses early success stories." But five to 10 years from now, he said, it "will come into its own and be safe and effective." The process of fixing certain inheritable diseases by accessing the genome and fixing the root cause is clearly far more complex than the "cut-and-paste" analogies Wilson used to explain advanced precision medicine techniques to non-scientists. But CRISPR-Cas9 is a "readily programmable genome-editing tool" that makes the process more intuitive and usable for researchers and clinicians than ever before. For an analogy, Wilson likened the use of similar techniques – known as zinc-finger nucleases (ZFNs) and transcription activator-like effector nucleases (TALENs) – as wheeling in an '80s-era arcade game to play Frogger or Pac-Man. CRISPR-Cas9, he said, was more akin to an easy and agile Playstation. Efficacy. Although cutting out a gene can be done reliably, it's still not easy or efficient to "paste" the corrected gene. Delivery. Researchers still lack robust and reliable technology for sending genome-editing enzymes to the cells in need of repair. Genetic understanding. Clinicians' ability to cure disease remains hamstrung by an impressive but still too limited knowledge of the underlying genetic causes, said Wilson. "The total scope of genome editing will be defined by our genetic understanding," he said. There are currently three conceivable approaches to genome-editing, in order of prevalence, said Wilson: ex vivo, in vivo (systemic), in vivo (targeted). The "earliest success stories will be ex vivo" – enabling clinicians to snip and edit genomes in a petri dish with a "high-efficiency that will let you do the 'pasting' of the effective gene that's hard to do in the host," he said. In vivo delivery – essentially allowing gene editing to be done by injection, whether into the body as a whole or "compartmentalized" to specific places such as the brain or the eye – is the "holy grail," said Wilson. The challenge, of course, is that it's hard to distribute effectively to the correct areas of the body. Taken as a whole, gene editing has come a long way in recent years. Early trials have been promising for diseases such as cancer, sickle cell anemia and eye disease, he said. Soon after, "I expect to see good progress on" cystic fibrosis, Duchenne muscular dystrophy, Huntington's disease and hemophilia. Then there are areas where "I think we'll be able to see genome editing applied to things that might be a bit more elective, but could have huge impact, since they're so common," said Wilson, such as Alzheimer's, diabetes, osteoporosis, HIV risk and cholesterol. Still, he cautioned, "we have to wait a few years to see how safe effective this could be." One complication for therapeutic genome editing is simply the existence of such a dizzying array of genetic diversity. Wilson notes that it's "kind of incredible" that, of 3 billion bases in the human genome, just 3 million bases ("a fraction of a percent") of are responsible for all human diversity." Moreover, 100 to 200 bases worth of new changes arise per generation. That means that close attention must be paid to genetic diversity and novel mutations in order to minimize the serious risks of off-target genomic editing. Still, Wilson is convinced that genome sequencing will "come to the forefront" of primary care in the near future, with these techniques more commonly identifying genetic risk factors. That comes with big responsibilities. Clinicians will have to design sequences to minimize off-target risks – something that demands whole-genome analysis – and "an established gene target will have several validated “flavors” of enzyme, and the appropriate one will be administered based on the patient’s genetic profile," he said.